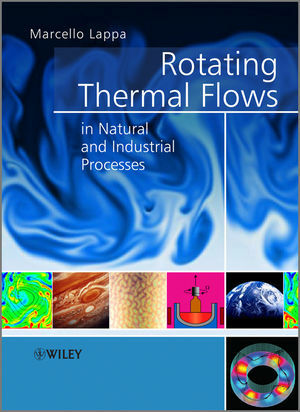 Rotating Thermal Flows in Natural and Industrial Processes provides the reader with a systematic description of the different types of thermal convection and flow instabilities in rotating systems, as present in materials, crystal growth, thermal engineering, meteorology, oceanography, geophysics and astrophysics. It expressly shows how the isomorphism between small and large scale phenomena becomes beneficial to the definition and ensuing development of an integrated comprehensive framework. This allows the reader to understand and assimilate the underlying, quintessential mechanisms without requiring familiarity with specific literature on the subject. Geostrophic Turbulence and planetary patterns. Covering a truly prodigious range of scales, from atmospheric and oceanic processes and fluid motion in "other solar-system bodies", to convection in its myriad manifestations in a variety of applications of technological relevance, this unifying text is an ideal reference for physicists and engineers, as well as an important resource for advanced students taking courses on the physics of fluids, fluid mechanics, thermal, mechanical and materials engineering, environmental phenomena, meteorology and geophysics. Dr Marcello Lappa received his M.Sc. and Ph.D. in Aerospace Engineering from the University of Naples "Federico II", Italy. He spent time as a post-doc at the University of Naples as well as at the Institute of Advanced Material Study, Fukuoka, Kyushu University in Japan. From 2002-2008 he was a Senior Researcher at the Microgravity Advanced Research and Support Center (MARS). From 2005-present he has served as Editor-in-chief of the International Scientific Journal Fluid Dynamics & Materials Processing. His research interests include: Buoyant flows; Thermocapillary (Marangoni) flows; Materials Processing — CFD; Control of flow patterns and their stability; Multi phase flows; Methods of numerical analysis in Computational Fluid; Dynamics and Heat/Mass Transfer; High Performance Computing; Biological fluid dynamics; Tissue Engineering and CFD.